Before the movies Saw, Paranormal Activity and Hostel (and countless remakes), there was the Scream Trilogy. Having been terrified by Poltergeist as a kid and IT as a teen, I was not a fan of scary movies (yes, I have coulrophobia). 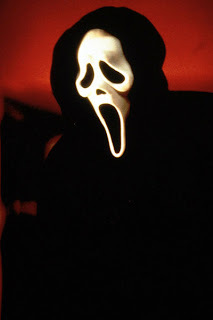 But that all changed when Scream came out All three movies were funny, suspenseful and very bloody. I've seen them all more times than I can count. I just love them! I thought the series ended fairly well, so when I heard about Scream 4, I was not happy. Then I heard the original, surviving members of the cast were coming back and was intrigued. But when I watched the following trailer this morning? Well, I was hooked and can't wait! The movie comes in April so you have plenty of time to watch Scream 1, 2, and 3.